For those wondering the technical details – she is using the same velocity shift ability she used on previous appearances to “fly”. 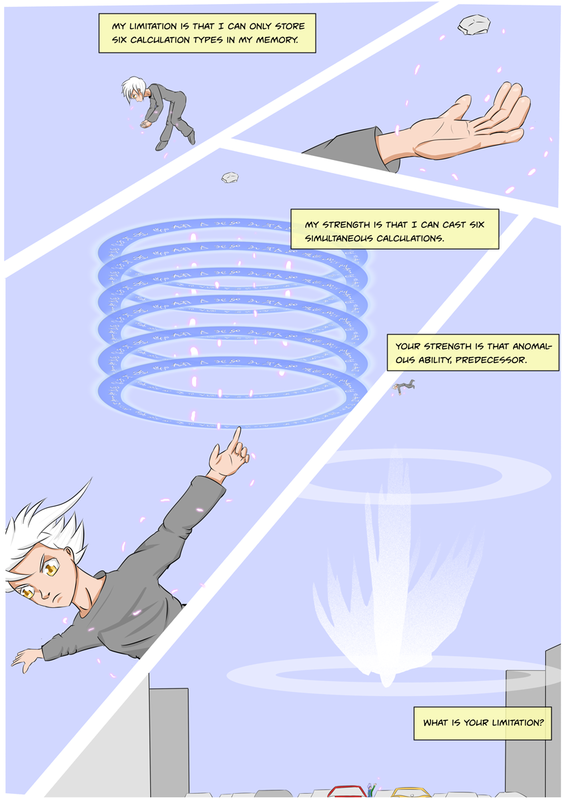 It simply changes the directional velocity of a specific Form within the calculation ring; by casting six sequentially with the correct timing she can accelerate an object far faster than most mages could ever how to accomplish with a single one – even people that could cast multiple acceleration shifts, to correctly time them in sequence effect the object passing through would be impossible for most natural mages. She’s wrong about one thing, though. Mium’s real strength isn’t the anomalous ability, it’s that she doesn’t understand his ability. Well, I give her points for at least trying something new at least. I think from a readers point of view she’s wrong on pretty much all accounts here 😀 Besides maybe what her strength is, cause it is pretty nifty in the setting. But it’s an interesting insight into how she thinks. Namely that she seems to view both herself and Mium as specialized mages; and probably identifies with him a little too much.